Agape Church has been impacting the world through its vision of training and sending out ministers of the Gospel. Agape Church is the local Indian church associated with Agape Full Gospel Ministries including Agape Bible College and Agape English School. All of these ministries are located at the Agape Center in Kerala, South India which houses the Church as well. Agape Church is actively working with these ministries and equipping the congregation with the knowledge and wisdom of the word of God. As a light to the community, Agape Church is bearing witness to the world of the great things that God has been doing through Agape Full Gospel Ministries. Agape Churches in Andhra Pradesh started in June 2012 by the grace of God. Through these local outreaches, we are reaching more people with the Love of Christ. 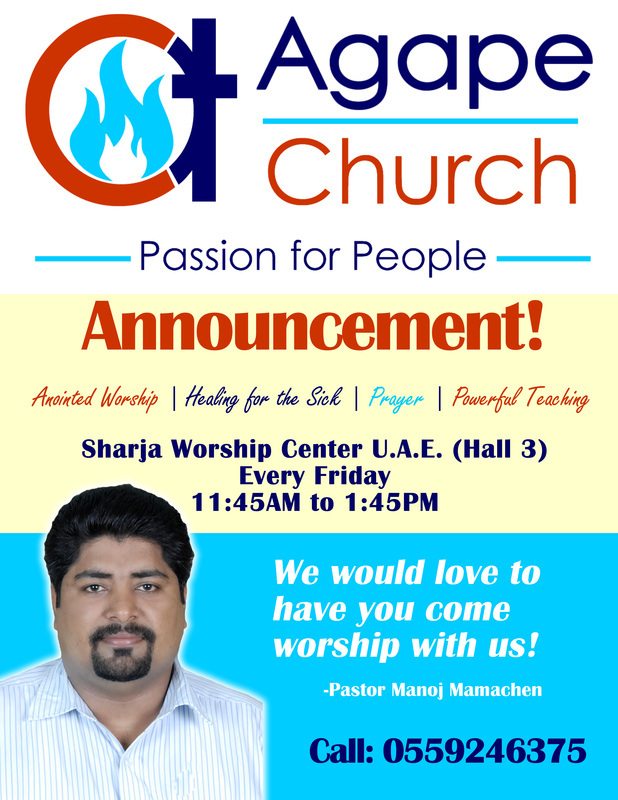 Agape Churches in Dubai, Sharjah, and Abu Dhabi are church plants in the Middle East that started in June 2012 by the grace of God. We hope to reach more people in the Middle East through Agape Church. It is very difficult for churches to find a place and time to worship in the Middle East, and we are very excited that God has opened these doors of opportunity. Continue to pray for these local outreaches in the Middle East.